Effortlessly collect, show and manage customer reviews with the one and only Trustbadge® technology for your ePages website! Once integrated, it updates automatically. As a user of ePages, from version 6.17 you can now use an updated Trusted Shops plugin which enables you to integrate the Trustbadge® more efficiently than ever before. If you do not have this version yet, your host will promptly make it available to you. If you have previously integrated the Trustbadge® manually, please delete it before continuing. If you have any questions regarding the configuration of the manual integration, please contact us at productintegration@trustedshops.com. As a next step, open the configuration menu in the back end of your ePages shop under Marketing >> Trusted Shops. Enter your Trusted Shops ID (starting with X...) here. This can be found in your My Trusted Shops account, for example. Alternatively, you can enter the URL address of your online shop into the text field to determine your Trusted Shops ID, as described below in step 3. Now click on Save to go to code entry. Under Language, select the language version of the front end in which you want the Trustbadge® to be displayed. Generate your personal Trustbadge® code using the code generator below. 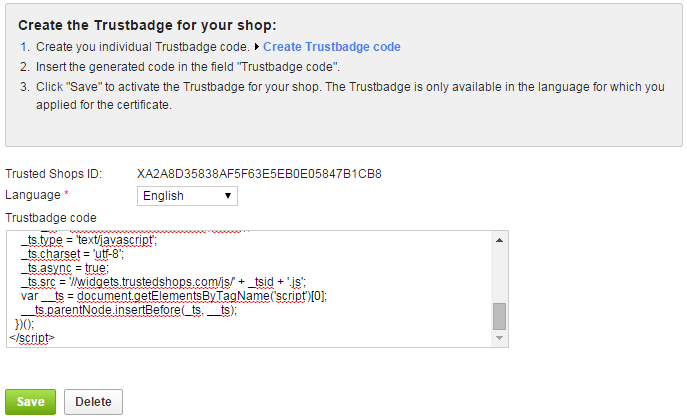 Copy the generated code to the clipboard and then insert it into the given text fieldTrustbadge-Code of your ePages backend. Finally, update the ePages website cache with the button indicated above. And with that, you will have successfully integrated the Trustbadge®®! As soon as your customers have completed their purchases, they now have the option to book the money-back guarantee free of charge as well as be reminded to submit a review. To send a review request to your existing customers, you can use the Review Collector. Have you selected Buyer Protection Excellence up to GBP 20,000 (available to your customers for a fee) in the order process? If so, please also follow the guide given above and activate the check box Certificate with buyer protection variant "Excellence", as described in step 2. Once you have entered the code, you can then record your Buyer Protection Excellence access data in the available entry fields. Log in to the back end of your ePages Shop and select Orders >> Orders. Select the orders of the last 2 – 3 months by ticking the checkboxes and click on Export >> Export as XML file. Save this file and open it in a spreadsheet programme on your computer (i.e. Microsoft Excel). Log in to My Trusted Shops. There you’ll find the Review collector tab under theRatings menu item. Follow three simple steps, upload the spreadsheet you’ve created, select which template you would like to use and hit the confirm button to send the e-mails to your customers. Congratulations, you’ll receive fresh reviews shortly.